Why would you let anyone but a dentist pull your teeth? Do you ever wonder why in some areas of life people will always go to an expert, and in others they will be happy to give it a go themselves? I suppose a lot depends on the value (perceived or otherwise) that is placed upon doing the job really well, and whether the benefits received are worth the risk or cost. For example, even if you had ample evidence that I was handy with a drill, you would still choose a dentist to look after your teeth. Likewise, I reckon I could do a pretty good job of loosening up your spine by cracking your neck (I’ve seen it done a few times), but I’m certain that you’d prefer an osteopath to do it for you. In both these examples, the cost of the procedure going wrong is barely worth thinking about! Using an expert would be a no-brainer. Counting the cost or reaping the reward! Let me add a little proviso here, before I continue. A business must weigh up the odds, when it comes to cost, and wise purchasing can add as much value to the bottom line as sales. But the ultimate cost should always be part of the final consideration! Most people would agree that errors usually carry a cost. How it is paid can vary (time wasted, hassle, financial penalties, stress, reworking, or a little bit of angst), but the point is that they can be avoided. Experts are called such not because they are perfect, but because they are more skilled in their specialist field than the majority of people. The definition of an expert, therefore, could be ‘one who makes fewer mistakes and gets a better result’. All of the examples I’ve cited so far have consequences for individuals. But what if one person’s expertise (or lack of) could have a knock-on effect throughout an entire business? I am, of course, talking about training. Consider the cumulative result of 20 administrative staff in an organisation being poorly trained in a task they carry out three times per day. Let’s say that an expert could have shown them a way to do the same task, better and in half the time; saving each person 10 minutes per task, three times per day. So, half an hour saved each, for 20 staff, means the company would be reducing its costs by 10 hours a day (50 hours per week). Poor training is one of the biggest costs in business today. Its consequences can go deep into a company’s processes, culture and response. Just one task, taught badly, could spread rapidly throughout the business like a forest fire and cause untold damage. 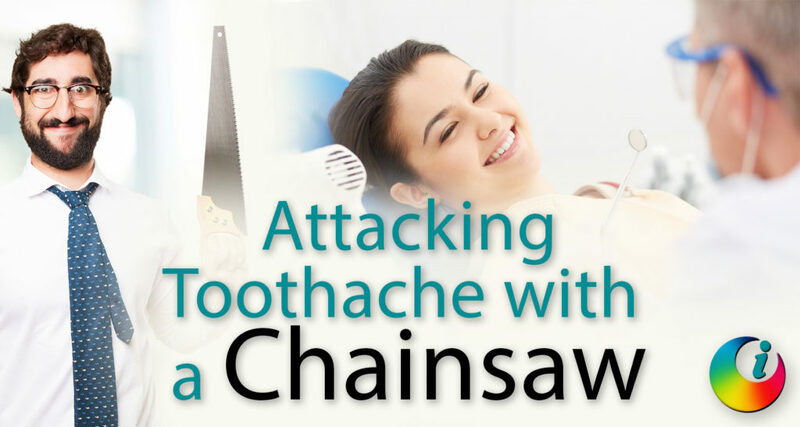 We’d all choose a dentist with a drill over a DIYer with a chainsaw, wouldn’t we? So why not choose a quality trainer to help your business reduce costly errors? Don't miss out on our time saving tips, get them directly to your inbox!